Family separation is a life transition for all members involved and a family divorce ritual is a way to foster an improved relationship between former partners while also cultivating relationships within the family. By participating in a divorce or separation ceremony, this marks the transition point for both the individuals and the family members. All members of the family undergo significant changes as a result of divorce. The Two Home Family Ritual may be used successfully by individuals, parents and their families. The Two Home Family Ritual symbolizes the beginning of a different family configuration. A candlelight ceremony can gently facilitate closure of one relationship and the restructuring of another, and clear the way for creating a two household family. The use of this candlelight ceremony can illustrate a commitment to a co-parenting relationship as well. Materials needed for this ceremony include one large free standing candle, two smaller candles and a match or lighter. If your children will be present, you will need a total of two larger candles. Step one: Light the large candle representing your marriage and say something positive about the day you were married. This candle represents your past as husband and wife. Candles such as this are often used in marriage ceremonies to illustrate that the individuals become united as one. Step four: One party or both extinguishes the large wedding candle that represented their marriage. This reveals mutual acceptance of the ending of that relationship. Be sure to keep your individual candles lit until the completion of the Two Home Family Ritual. Allow the light of your smaller candle to represent your personal path and to be a guide as you move into the next stage of your life. If you choose to have your children present to help them acknowledge the reality of the divorce, make sure that neither party will say anything that will make the children uncomfortable. Using the remaining large free standing candle inform everyone present that this candle represents your commitment to your children and to co-parent forever. Light this new Co-Parenting Candle and state something about how this new candle represents your co-parenting relationship. Each party should make a verbal commitment with their child to stay child focused and work with each other as a parenting team. “Your dad and I love you both very much. We will always be your parents and we will always be there for you. Even though we have gotten a divorce and we are no longer husband and wife, we will be your parents forever. We want you to know that we will be committed to working together as a team and keep you out of the middle. This is our promise to you from this day forward.” Allow this portion of the ceremony to signify your ongoing love for your child and your new relationship as co-parents rather than spouses or partners,. Allow the ceremony to symbolize a change of your long-term role from intimate partners, to partners in parenting. Recognize the ceremony validates yourself and your former partner, reclaiming mutual respect and cooperation, and honoring each other as individuals and as parents. 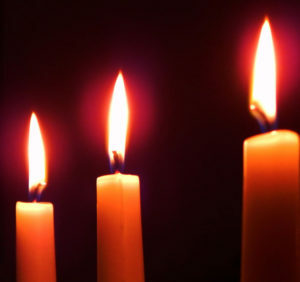 Acknowledge that the movement from the larger candle to the two smaller candles demonstrates the change from united in marriage to two separate and distinct individuals. Allow the fourth co-parenting candle to demonstrate a new united relationship as co-parents. Take responsibility for making a commitment to care for your children, to do whatever it takes to improve the long-term well being of your children. Use the heat of the flame to remind you of your warmth and compassion for your children. Move into the future by choosing to shield your child from conflict and acknowledge the transition to creating a well-functioning two household family. Let the brightness of the flame remind you of a hopeful outlook. Allow your child to love both parents. Like each individual flame, recognize that each parent offers something special to the child. Accept co-parenting is forever and agree to cooperate on behalf of the children. Acknowledge positive aspects of the intact family with heartfelt moments and treasured memories. Remembering the positive times can help you and your children accept and heal from the separation. If you have a collaborative relationship consider jointly selecting and creating a slideshow or collage of family photos representing positive times together as an intact family similar what is prepared at a funeral. Consider making these photos into two separate printed books to present to your children at the ceremony. The children can keep one in each home. Consider inscribing something positive inside the cover of each book and have both parents sign and date each signature. Be sure the books have the same inscription and signatures. Take the time to reframe a negative life change such as divorce into a new reality that is as positive as possible. Create a reality full of hope for all parties involved.